Machine learning and Deep learning architectures are driving efficiencies and automation across enterprise systems and creating challenges for infrastructure architects in order to deliver the desired outcomes. These issues are manifested through infrastructure I/O bottlenecks that result poor ingest throughput performance that slow cognitive system training times due to excessive latencies. 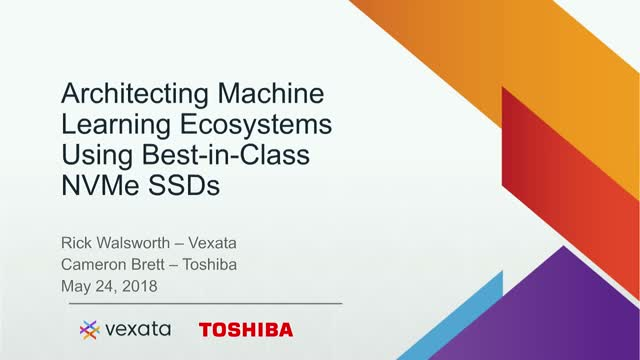 In this webinar, Toshiba and Vexata join forces to provide actionable information about the latest generation of NVMe based solid state drive (SSD) media and how to architect systems to deliver the low latency, high bandwidth I/O services to these advanced neural nets and cognitive systems. Join this webinar and learn about the latest technologies, architectures and best practices purpose built for these AI ecosystems. 3. Use cases and customer examples that have deployed these architectures for machine learning environments. •Boost Oracle Database performance by 6X or more without the need to replace existing host servers or primary storage array. •Demonstrate these dramatic performance gains in your own Oracle environment along with technical documentation and resources to deploy Smart Flash Cache with no risk. •Best practices to eliminate bottlenecks for tick-analytics, strategic back-testing, algorithmic modeling, etc. •Matt Meinel, Senior Vice President of Solutions Architecture, Levyx Inc.
Data is doubling every two years, driven by human and machine-generated data, such as the Internet of Things (IoT). The analysis of patData is doubling every two years, driven by human and machine-generated data, such as the Internet of Things (IoT). The analysis of patterns and structure in this data and its transformation into actionable insights is driven by Artificial Intelligence (AI), Machine Learning (ML), and Deep Learning (DL) workloads. IDC predicts that in the next three years over half the businesses will use AI, ML, and DL workloads. This has given rise to the NVIDIA DGX-1 GPU-based supercomputer to accelerate these workloads. Vexata supports the DGX-1 and delivers ultra-low latency, massive ingest bandwidth, and heavy mixed random and sequential read/write I/O operations. Using direct attached storage (DAS) or all-flash arrays (AFAs) limits the usefulness of the DGX-1 by restraining performance and requiring complex data provisioning, mobility, and growth. Vexata addresses these issues with VelocityAI, which combines the NVIDIA DGX-1 and the Vexata VX-100FS Scalable NVMe File Array. Learn how you can leverage VelocityAI to deliver transformative performance with breakthrough economics at scale for your AI, ML, and DL applications. 94% of the Fortune Global 100 use SAS analytics. Through innovative software and services, SAS empowers and inspires customers around the world to transform data into intelligence. IDC predicts by 2019, 40% of Data Transformation initiatives will use AI services; by 2021, 75% of commercial enterprise apps will use AI, over 90% of consumers will interact with customer support bots, and over 50% of new industrial robots will leverage AI. Data-driven applications and Machine Learning (ML) workloads, using SAS analytics are increasing in volume and complexity as organizations look to reduce training and operational timelines for artificial intelligence (AI) use cases. To enable predictive and cognitive analytics, you need to accelerate training and operations by delivering ultra-low latency with massive ingest bandwidths when faced with heavy mixed random and sequential read/write workloads. Learn how to identify your SAS analytics IO bottlenecks and leverage Vexata VX-100 with its transformative VX-OS purpose-built to overcome these challenges. Vexata provides NVMe-based storage solutions that maximize VMware virtualized workloads providing massive consolidation, high performance for enterprise workloads such as Oracle, SQL Server, and SAS Analytics. This demo provides an exclusive view into consolidating mission critical Oracle workloads on VMs supporting a range of mixed OLTP, Analytics and Data Warehouse workloads delivering ultra-low latency over increasing workloads. If you are considering moving enterprise applications into VMware virtualized environments, Vexata delivers the performance and scale to do so with confidence. -Tradeoffs and decision to utilize mixed mode FC and GbE deployments. NVMe-oF solution presented to show how the system performs for high frequency, enterprise use cases. As enterprises transition their Business Intelligence and Analytics environments to Machine Learning and Artificial Intelligence driven ecosystems, their core data infrastructure has to scale. Focusing only on the compute layers, creates a highly inefficient infrastructure. Vexata with its VX-OS version 3.5 release brings to market transformative economics and breakthrough performance to power these next-generation workloads at scale.e. As Enterprises transition to online data-driven transactional business models, the need to support more customers and users at scale, typically means massive investments for Oracle database licenses and the supporting data infrastructure. But most enterprise infrastructure is not optimized to maximize the performance of CPUs in their database servers resulting in wasted resources and poor utilization of these expensive Oracle licenses. Are the bottlenecks in their current infrastructure well understood? With a plethora of solid state storage options available, do infrastructure architects know how to effectively evaluate and select the best storage platform to reduce Oracle TCO? The key to optimizing your Oracle infrastructure spend is the focus of this webinar where Vexata solution architects will address some of the common misconceptions related to scaling Oracle ecosystems using case studies and best practices to deliver massive performance improvements and realize significant cost savings. •How to maximize database performance including how to optimize CPU cores based on deploying solid-state storage systems. We will review the state of infrastructure through the eyes of DBAs, database architects, and systems engineers and help them understand what they need to know for their current platforms and future platform design. Digital Transformation is cutting across industries and making a profound impact in our lives. Data is the new oil, however, businesses need a different approach to drill this oil, in a way it impacts the business processes positively and instantaneously. Existing datacenter infrastructure falls short in meeting the requirements of these new distributed and massively parallel pipelines and datatypes and need to evolve. Several trends are proving to democratize Digital Transformation vision and technologies are emerging as building blocks. Notably Convergence of HPC, Big Data Analytics, and Artificial intelligence markets, driven by GPU computing, open sourcing of ML / DL frameworks, Distributed architectures, faster storage media like NVMe and 3D-Xpoint and faster networking with NVMeOF are fueling these trends. Join this webinar and learn about the latest industry trends, vertical use cases and how Vexata with its Active Data Fabric ecosystem is uniquely positioned to help its customers cross the chasm. 2. Business Value of Digital Transformation – remain competitive, survive and thrive. This demo of the Vexata VX-100F scalable storage system using NVMe SSDs via Fibre Channel running SQL server analytics, illustrating how database administrators can accelerate data loads via system read bandwidth that exceeds 46 gigabytes per second. Overall, the Vexata VX-100F increases server performance by up to 10x delivering faster, more accurate insights while dramatically reducing data center TCO. Hybrid transaction/analytical processing (HTAP) refers to capabilities to perform OLAP (online analytical processing) and OLTP (online transaction processing) at the same time on a same database system. Oracle Database has always held the edge in HTAP because its version-based concurrency model means that analytical workloads do not block transactional workloads. In this webcast, we will examine how Vexata Scalable Storage Systems utilize technologies such as NVMe Flash and Intel Optane (3D XPoint) can be used to take HTAP to the next level. This webcast will include a demonstration of HTAP running on Oracle 12c with the Vexata VX-100 Scalable Storage System. Successful analytics and transactional systems start with proper architectural principles and considerations. This webinar will be a detailed walkthrough of all the software and hardware infrastructure below the database server. It will explain how each layer affects database workloads as well as give tools and metrics for determining optimal architectural configurations. • Tools and metrics to determine appropriate hardware allocations. For example, how many CPU cores, data volumes, tempdb files or GBs of memory are needed for your workload. Presented by Matt Henderson, who has over two decades of experience in designing high-performance database platforms and over five years working with the latest all-flash storage technologies. He currently is the Director of Microsoft Technologies at Vexata where he helps customers optimize and scale their mission-critical databases.